You should see the insurance policy they have on that recipe...no joke. But I agree, their chicken makes me sick. The secrecy is because if we knew what was in it we wouldn't eat it. I used to like KFC,haven't had it for some time. People replicated the taste. May be not exact mix but who cares. 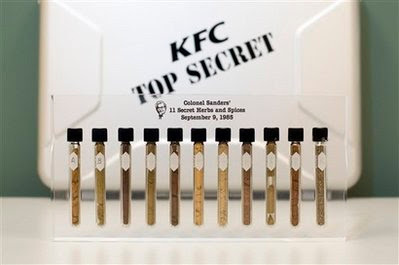 Moreover, if they changed the secret recipe today only people who eat there everyday would even notice. Moxie, is that really you????? We are so close that we can taste it!